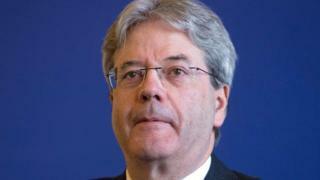 Italian Foreign Minister Paolo Gentiloni has been asked to form a government by the country's president. President Sergio Mattarella has been looking for a replacement for centre-left PM Matteo Renzi, who resigned after losing a referendum on constitutional reform last week. Mr Gentiloni, 62, is a loyalist from Mr Renzi's Democratic Party. Correspondents say that if he is successful in rallying support a government could be formed in days. In a brief acceptance speech, Mr Gentiloni said he realised the urgency of forming the government to reassure the country. He said he would work within the framework of the previous administration, making it likely that he will reappoint several ministers. Mr Gentiloni faces a banking crisis and a rise in popular support for anti-establishment and eurosceptic parties. Opposition parties have ruled out joining a national unity government, with the populist Five Star Movement saying it will boycott a parliamentary approval vote, due to take place on Wednesday, because it would have not legitimacy. The party has called for immediate elections, currently due to be held in May 2018. However, President Mattarella has said the current electoral rules must be revised so both houses of parliament are synchronised. The law was changed to the so-called "Italicum" system last year to give the leading party a parliamentary majority through bonus seats in the lower Chamber of Deputies. But there has been no such change in the Senate, which is elected by proportional representation. Senate reforms formed part of the package of reforms put to Italian voters last Sunday, while the legitimacy of the system for the Chamber of Deputies is to be ruled on in January. Mr Renzi's plans for constitutional reform were rejected by a margin of 59% to 41%, prompting his decision to stand down. More than a stopgap leader? Until a few days ago, Mr Gentiloni's name was not even mentioned as a possible prime minister. Paradoxically, this apparent lack of prominence and ambition may have been what persuaded others to support him. After a period of high drama, Italy often picks a workmanlike, conflict-free figure as a new leader. Image caption Italy has chosen a "workmanlike, conflict-free figure"
In theory, Mr Gentiloni has up to 14 months in office before elections must be held. But many here believe that polls will be held before then. What's more, the opposition Five Star Movement already accuses Paolo Gentiloni of being a puppet of his predecessor, Matteo Renzi. Mr Renzi remains the leader of the Democratic Party, of which Mr Gentiloni is a member. Italy's new prime minister will now have to prove that he is his own man - not just a stopgap for someone else. Most Italian commentators regard Paolo Gentiloni as a very different character from his predecessor, Matteo Renzi, but some wonder if he will be able to be his own man. Fabio Martini, writing in La Stampa, describes Mr Gentiloni as "Paolo the Cold", saying that "seething passions" are alien to him and that "in style and character, he is the complete opposite of Matteo Renzi". Gerardo Pelosi writes in Il Sole 24 Ore that although Mr Gentiloni appears so far to have preferred to keep a low profile, in the two years that he has served as foreign minister he has won respect in European and world capitals. La Repubblica's Goffredo De Marchis says that "time will tell if he has what it takes to be a leader, or if he will govern according to the wishes of Renzi and the Democratic Party".